Despite the fact that it first released all the way back in 2011 (a whole console generation ago! 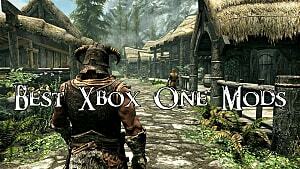 ), Skyrim remains the king of RPGs to this day. 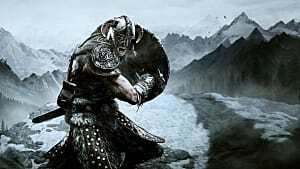 Bethesda's snowy romp in The Elder Scrolls universe is critically acclaimed; it's been re-released multiple times in six years, it's still a top seller, and for Xbox players, it sometimes feels like its the only console RPG in existence. 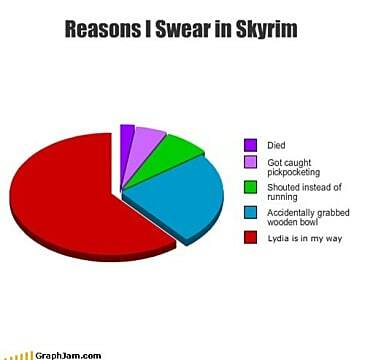 Skyrim is not a good game. Honestly, it just barely even qualifies for the term "RPG", and it's among the worst role-playing experiences on any platform in any generation. I distinctly remember giggling when a group of dour monks atop a mountain were teaching me how to "shout". Why shouts? You get them from killing dragons, so wouldn't it make sense -- and be less silly -- to call them roars or something? I mean, I've literally "shouted" people to death, which doesn't feel very epic to say out loud. The whole magic system, even outside the top-volume yelling of shouts, is pretty boring overall. While there are a few interesting incantations like transmuting ores or breathing underwater, most of the spell work consists of long range attacks that might as well be gun shots. The main game loop is incredibly boring for a spellcaster class, where you hold down RT and aim a stream of fire at enemies -- and repeat, and repeat, and repeat, and repeat. 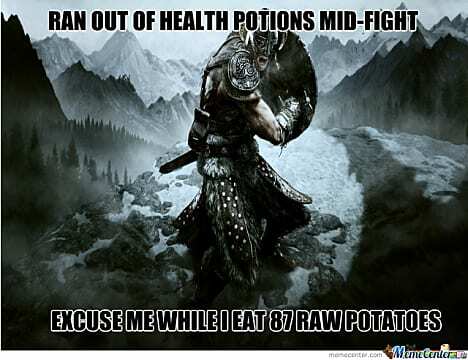 The poor spell choice really becomes apparent when comparing Skyrim to RPGs of the past. Think of games like Arx Fatalis or Ultima Underworld, where dozens of interesting spells are learned by drawing different rune combinations. Or even think of a newer game like Pillars of Eternity, where the arcane and divine magic systems are intricately bound into the world story. Even if most of the spells there are based around combat, there are still far more options at hand than just "summon a monster" or "lob a fireball." 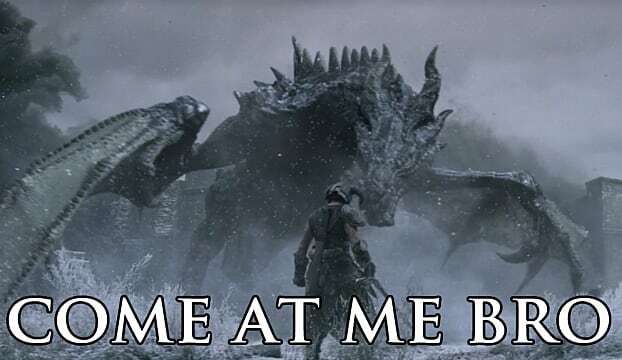 From transforming into a bear to hobbling enemies and knocking them prone and making them sick, or even sending them fleeing in terror, there are far more options in other big RPGs than in the streamlined Skyrim. On the action-focused gameplay side with light RPG elements (a sub-genre where Skyrim frankly belongs), even games like Dishonored manage to have more interesting magic systems, ones that really expand your gameplay options, from blinking short distances for stealth to slowing time and chaining possessions between targets. Even these are more interesting choices. Did I mention the companions are annoying and the UI isn't great? Here's one of the biggest drawbacks to Skyrim: it may be beautiful and it may be populated with a huge number of people and creatures to interact with... but there's no point in doing so. There is nothing remotely interesting going on with any of the NPCs in Skyrim, and the dialog segments -- the heart and soul of any serious RPG -- are the definition of "skippable". 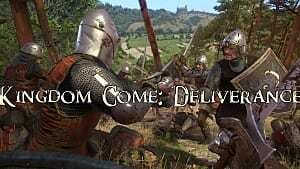 There really aren't any game-changing (or even mildly interesting) dialog options to find based on what race you chose, what skills you've unlocked, or what quest paths you took. Even the sad Fallout 4 dialog wheel, with its total lack of real options, feels like an upgrade from Skyrim's complete void of meaningful conversation. There's no point in even looking at the dialog options. Just press them all (or ideally, figure out which one is "I accept this quest" and ends the conversation) and get on to the next combat section. If they aren't boring and forgettable, NPCs typically interact with the main characters in only one way: heavy-handedness -- in the extreme. My first moments in Whiterun involved a little girl running up and asking for a coin. When I gave it to her, she asked if I'd be her daddy. Next, she informed me I needed to buy a house if I was going to adopt her. This lazy approach at storytelling and on-the-nose "character development" would be bad news for any game, but for an RPG, it's the kiss of death. Skyrim's primary claim to fame is its massive open world -- explore wherever you want, in whatever order you want. So long as you don't come across any giants (which seem near invulnerable at times), you'll be fine. A fire-breathing dragon that can fly miles above you? No worries, you can take him down at level 2 or so. But it's not even that that's the issue. Instead, here's the problem: in all those hundreds of miles of digital landscape, there's nothing legitimately worth exploring, and no NPCs you will remember five minutes later. There's lots of caves filled with bad guys and chests, and plenty of local rulers or wizards who need you to fetch things for them, but nothing that makes the world really feel alive. Forget meeting anyone like Durance from Pillars of Eternity or absolutely any companion in Planescape: Torment, many who are still fresh in the minds of gamers decades later. There isn't even anyone like Moira from Fallout 3 or Victor from New Vegas to offer a little flavor and keep you engaged. 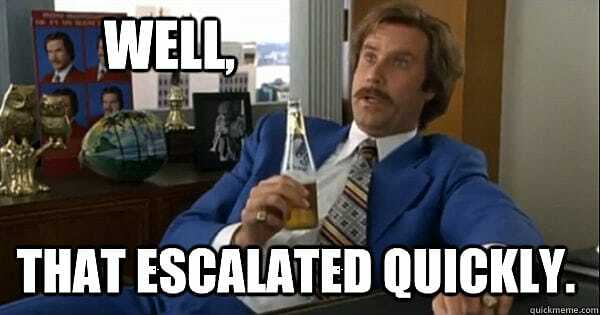 Moira was literally just a quest giver -- a MacGuffin meant to get you to explore areas A, B, and C -- yet I can still clearly hear her voice and recite some of her more absurd requests, or even explanations of how badly you are going to be injured. The way you chose to interact with her and complete her requests actually changed the feel of that game and gave your character a personality. 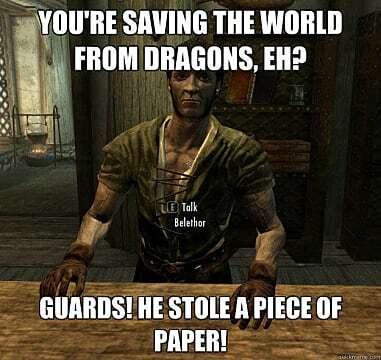 Can any quest dispenser in Skyrim say the same? Thinking back, I honestly can't recall a single NPC name from my entire playthrough. Apparently, one of them was named "Belethor". If you've followed my articles in the past, you will already be aware of this, but for those who aren't in the know: I'm a filthy casual. With a few exceptions like Darkest Dungeon and The Surge, I'm not keen on games that are overly hard on purpose. 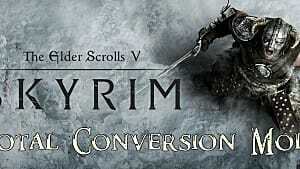 That being said, Skyrim has become so dumbed-down on the mechanics side of the house that it's barely worth playing. The skills, attributes, and spells have been so streamlined it doesn't really feel like The Elder Scrolls anymore. We went from six stats to three extremely basic ones -- health, magicka, and stamina. A host of skills like short blade, mysticism, athletics, and spear were all culled out. That's not the primary offender, though -- the big problem is the quest system and the extremely bare bones quest info screen. Here's the entire game in a nutshell: just follow the pointer on the map, kill the thing or pick up the thing, then follow the pointer back. Is there lore or story building in there somewhere? No idea, the quest screen doesn't even give any useful info, let alone any flavor text to flesh out the world. Those pointless quests you are trying to tick off the screen are also bland in the extreme. Even a college of scheming mages -- a place ripe for interesting story development and offbeat tasks -- devolves immediately into dungeon raiding and fetch quests. It's these critical failures in particular that make me question if Skyrim really even should be called an "RPG". It's more an action game that happens to take place in a fantasy world. Remember the accidental shouting bringing down the wrath of the guards of whatever forgettable town you happen to be visiting to sell your 87 longswords? That's just the tip of the iceberg of Skyrim's ludicrous guard A.I. Half of the time, an arrow to the head makes them wonder if they heard something, and the other half, they are so overly sensitive that self-defense is out of the question. I lost track of the number of times I had to re-load because a squad of vampire assassins attacked me in the street. If I made the mistake of defending myself, the guards would always go hostile for no apparent reason, and then I'd be running from an entire city trying to kill me. Even in Bethesda's other open world games like Fallout, where you can accidentally steal an apple and get chased down with pitchforks, there aren't nearly as many issues with having a whole town turn against the main character. You'd have to pretty much start directly opening fire on civilians or lobbing grenades to get all of Megaton aggroed. This is one instance where more advanced technology doesn't always lead to a smoother experience. Sure, games like Baldur's Gate aren't as visually stunning as Skyrim, but they rarely have problems of this sort -- you've got to deliberately do something bad or indiscriminately lob fireballs at crowds to get the guards riled up. 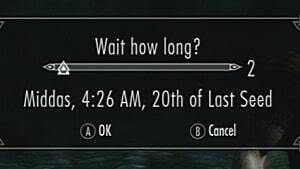 This one isn't unique to Skyrim, but rather is an issue with most of Bethesda's games. It's a design choice I just can't even begin to comprehend: why is there an extremely in-depth facial designer... in a FIRST-PERSON GAME? Why on earth are you spending three or four hours making the perfect face for your character that you will literally never see again? Did you happen to equip a helmet at any point? Cool, now it really doesn't matter what race or facial features you picked. 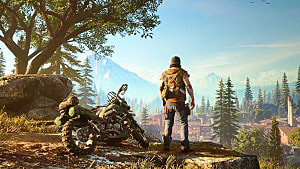 Granted, you can switch to third-person view for a less-than-ideal experience, but you'll still be spending the vast majority of the game looking forward, not swinging the camera around to ooh and aah at your own face. This whole system should be ditched and those development hours go into making the quests more entertaining and the NPCs more interesting. 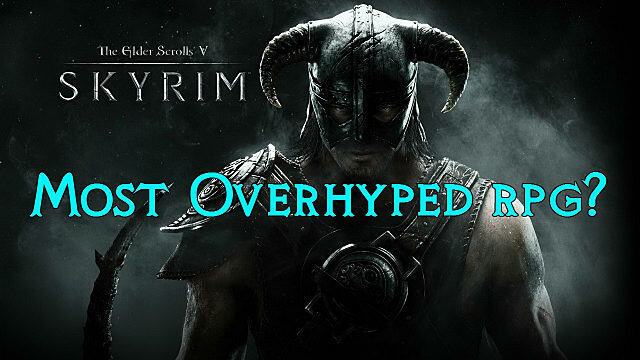 Alright, we're reaching the end of my Skyrim gripes, which means we're almost at the part where you get to tell me how dumb I am in the comments! Last up, we've got to discuss the dead horse that just keeps on taking a beating. 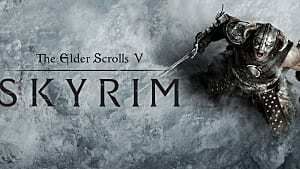 Skyrim came out six years ago, and fans have had the pleasure of buying the game on the 360, the PS4, an enhanced version on PC, and now Bethesda's big news of E3 has arrived: we get to buy it again on the Switch and experience it in VR on the PS4. Lucky us! 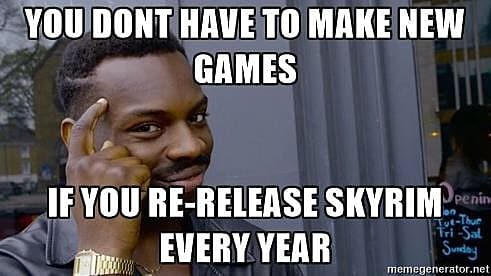 There simply hasn't been enough changed between each version of Skyrim to warrant buying it four or five separate times. While the jagged edges on objects may have gotten slightly smoother, all the core problems present in the game -- from bugs that cause objects to get stuck in space to the lackluster quest system -- continue to exist in each iteration. Alright, so I'll admit -- Skyrim can be a fun game, if you have a ton of mods installed, and if you don't care about story or characters, then sure, it's a an aesthetically pleasing time-waster with a seemingly endless world map. But if you actually want a compelling, immersive experience featuring characters to care about or a story you'll be talking about a decade from now? 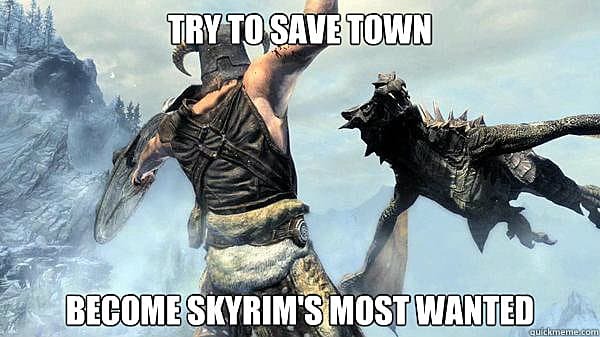 Don't even bother -- there are hundreds of better RPGs out there, and Skyrim doesn't remotely live up to the hype.